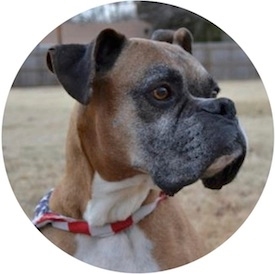 Maverick is a senior boxer around 10 years old who appears to be in great shape. He has no known health issues; he just needs to gain a couple of pounds. He is thin at 55 lbs. Maverick is good with other dogs, cats and kids. Maverick was surrendered to a local shelter due to a divorce and was not doing well there so he moved to a foster home with RCHS. Maverick is past the stage of appreciating other dogs bouncing off of him so he would prefer other mature doggie friends in his new home. He has excellent indoor manners and isn’t shy about meeting new humans. Maverick knows sit and has pretty good leash manners. He is completely potty trained and has great recall. Maverick is an awesome dog and his future family will be very lucky to have him!